Version: 12.2+ As this guide assumes the use of systemd and GRUB 2, this guide may not work for very old versions below 12.2. Upon installing openSUSE, the X system's automatic configuration may have failed to properly configure the graphics correctly. Typically this results in either a black screen upon reboot, or the wrong resolution being used in the graphical login manager and in X sessions. This guide is for all supported openSUSE versions up to and including openSUSE Tumbleweed. Typically the cause is your graphics are not configured properly. The reason for the misconfiguration can vary, dependent upon your openSUSE version. With most modern hardware using a single display, configuration is automagic on-the-fly at each session start - no permanent display configuration files are needed. This section provides some guidance on how to sort out your graphic problem. It is recommended one determine their openSUSE version and read up on some practical graphic theory before proceeding to solve their problem. You need to know which openSUSE version in order to select the optimal solution to solve your problem. Given you likely have a graphic problem, your PC may only show the 1st two lines and not the kernel driver. If you have a hybrid graphics device, you may even see evidence of two graphics cards. please proceed to the next steps in this guide. Experienced Linux users should note that in the vast majority of cases /etc/X11/xorg.conf and /etc/X11/xorg.conf.d/50-[device,monitor,screen].conf files are not needed for any openSUSE version AFTER 11.1. The first thing to try is to boot from GRUB 2 with boot code "nomodeset". In openSUSE 13.2 or newer if you have a GeForce 61XX gfxchip, try first: nouveau.config=NvMSI=0. If you have already installed openSUSE, follow the steps here to boot with "nomodeset". If you are installing openSUSE on a regular BIOS fitted PC, select the "No KMS" menu under F3, which does the same thing as "nomodeset". Note that nomodeset on GRUB 2's kernel cmdline prevents the AMDGPU, Intel, Modesetting, Nouveau and Radeon FOSS DDX drivers from functioning. Non-availability of kernel modesetting (KMS) will either prevent Xorg from starting entirely, or cause it to run in a crippled low resolution (fallback) VESA or FBDEV mode suitable in most cases only for simple troubleshooting, or for servers with little or no need for graphical apps. This option is intended primarily to ensure access to a login prompt on vttys[1-6], and allow editing of configuration files. See SDB:Nomodeset:_Work_Around_Graphic_Upgrade_&_Installation_Obstacles for additional nomodeset detail. The 2nd thing to try (if the above did not work) is to try booting from GRUB with a more safe setting. If installation failed, try using the Safe Settings option (press F5 to load the GRUB "Kernel Default" menu). If you have already installed openSUSE, choose in the GRUB 2 boot menu Advanced options for openSUSE Leap (or what ever your openSUSE version may be).. If this works, you may wish to stop here. But for users with installed systems, whether that succeeds or not, you may wish to read on to see if you can better optimize your system. The 3rd thing to try is boot to multi-user.target (a full screen text mode) and try to use the installation graphic configuration file xorg.conf.install as a temporary measure. and enter the root/administrator user password when prompted for a password. New users note that Linux is case-sensitive and so be accurate when typing uppercase and lower case characters, as they are treated differently. X11 is NOT the same as x11. Hopefully that will allow a boot to a graphical X window with the FBDEV driver. If this works, you "may" wish to stop here. However that driver is VERY low quality and you may wish to continue to the next step, even IF you have that functioning. The 4th thing to try is to edit the configuration file for X window graphics to attempt to force a boot to a specific graphic driver. If you have not read the practical theory guide referenced above, PLEASE do so now, else this step will be difficult to understand. New users - again note that Linux is case-sensitive and so be accurate when typing uppercase and lower case characters, as they are treated differently. X11 is NOT the same as x11. Then edit the /etc/X11/xorg.conf.d/50-device.conf file, adding an entry for your chosen graphic driver. You will need to do this from a text editor with root permissions. Enter root password when prompted. To edit the file, press I to enter insert mode. Once in insert mode, use the arrow keys to move the cursor and type as normal. After making the necessary edits, to exit Vim press Esc, then type ":wq" (without the quotes), then press Enter. Be very careful as one is using this editor with root permissions. Tip: Prior to doing the above, check the openSUSE Video Hardware Compatibility List (HCL) for guidance on what graphics drivers are available for use on openSUSE Leap. where in the example above the line Driver amdgpu was added to try force the load of the open source "amdgpu" graphic driver for recent AMD cards. It is important one read the practical theory guide referenced above to understand what graphic drivers may be available. 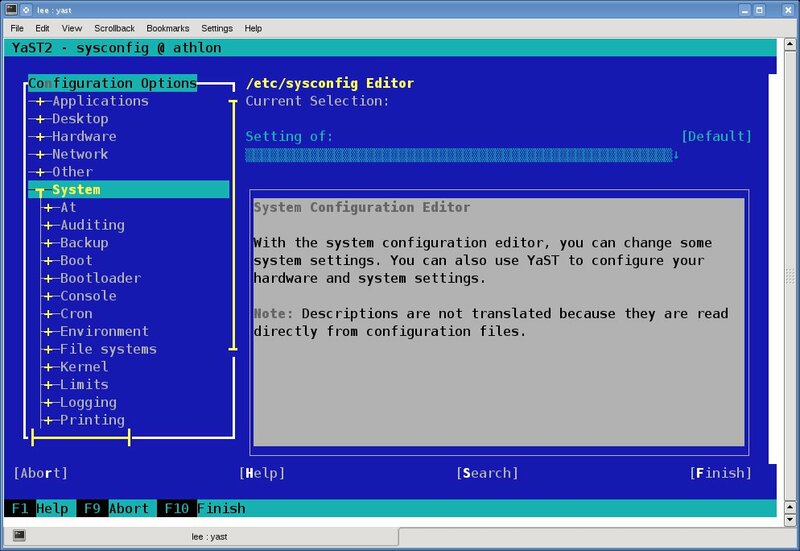 It may also be necessary to run "yast" (you can run yast in text mode with root permissions if X window not available) and navigate to yast > System > /etc/sysconfig Editor > System > Kernel > NO_KMS_IN_INITRD and change it to "yes". This takes a minute or two to save once changed is submitted. (see below image examples). Use the spacebar, tab key, enter key, and arrows to navigate yast in text mode, and then follow the example screens. In case a more complex edit is needed (hopefully not needed), then another example of an edit in the /etc/X11/xorg.conf.d/ directory (but this time to configure a monitor instead of specifying a graphic driver) is an openSUSE forum example of customizing the 50-monitor.conf file. Note one might have to click on that link twice to connect to the proper page. Hopefully your PC will boot to X window graphical desktop and if this works, you may wish to stop here. Warning: The following almost never works any more absent extensive customization. It's far more likely to generate a segfault than a usable file, and even if it does create a file, it will contain far more useless non-display-related parts than display-related parts, obfuscating parts with the potential to be useful. The parts with potential to be useful would need customization to be able to do any better than Xorg's automagic does by default. The 5th thing to try is to try to create your own version of the "classic/legacy" xorg.conf custom configuration file for the graphics. This is more precisely known as the /etc/X11/xorg.conf file. In fact this step does in part what the old sax2 configuration wizard (removed in 11.3) used to do for openSUSE (but this is less capable). Some users may even have a copy of their old xorg.conf from a previous Linux install that they might try (although it may not work with openSUSE Leap). Again, if you have not read the practical theory guide referenced above, PLEASE do so now, else this step will be difficult to understand. If it doesn't segfault it will create the file /root/xorg.conf.new. New users note that Linux is case-sensitive and so be accurate when typing uppercase and lower case characters, as they are treated differently. 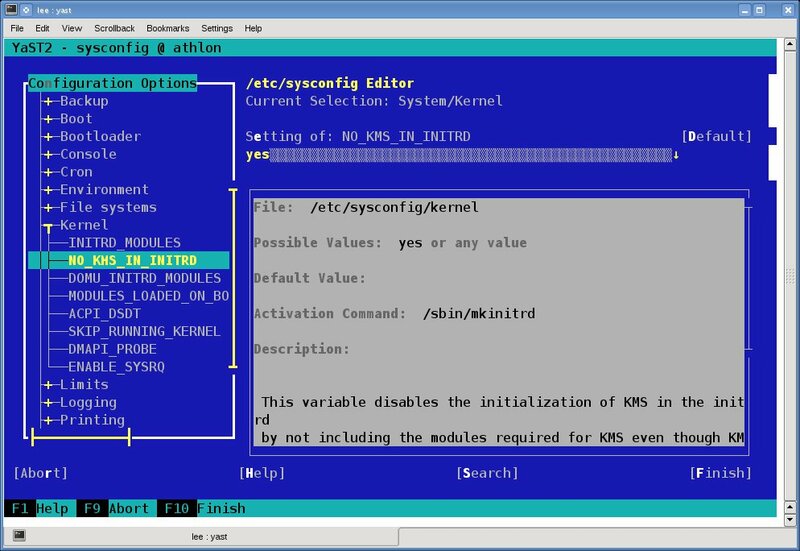 Xorg in the command is NOT the same as xorg in the subsequent xorg.conf.new file name. If you are lucky, you will then be able to reboot (as described above) by typing systemctl reboot and you might successfully boot to an X window desktop. However, it is also possible you may need to change the driver in that /etc/X11/xorg.conf file, and to do so you need to open it with a text editor (see Step 4 for example of using Vim) with root permissions and then change the driver. For example you may need to change "nouveau" to "modesetting" in the device section of that file, such that the "modesetting" driver is used instead of the "nouveau" driver. Again, per step#4 above, NVIDIA graphic card users may need to black list the "nouveau" driver and change NO_KMS_IN_INITRD to "yes" with the sysconfig editor (see step#4 above). Again, per step#4 above, NVIDIA graphic card users may need to black list the "nouveau" driver in the /etc/modprobe.d/50-blacklist.conf file, for example with root permissions by typing: echo "blacklist nouveau" >> /etc/modprobe.d/50-blacklist.conf and also change NO_KMS_IN_INITRD to "yes" with the sysconfig editor (see step#4 above). If instead your PC has Intel integrated graphics or a VIA graphic card or other graphic card, then you need to again consult with the practical theory guide to determine what your options are for the VIA and Intel graphics devices. The 7th thing to try - Try Udev edits as last resort. This wiki was created to address an action associated with openSUSE bug report 608237. An related issue is also in openSUSE feature tracking: openFATE #308357: Replacement for Sax2 in 11.3. Below are some references to other wiki, which provide useful information on configuring one's graphics in openSUSE. Configuring openSUSE graphic cards is an older wiki on the same subject, but with less technical content (as to different options/steps available). openSUSE Hardware Compatibility List (HCL) for Video cards provides a link to data provided by users on the compatibility of their video cards with openSUSE Linux. This page was last modified on 17 March 2019, at 19:20. This page has been accessed 534,522 times.